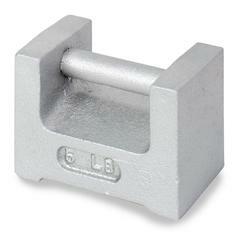 Weights are available in sizes ranging from 2 kg through 2000 kg and are available in NIST Class F.
Weights are manufactured from high quality iron that meets specifications for hardness. Castings are free of cracks, pits and sharp edges and meet surface roughness requirements. Each weight has an adjusting cavity located on its side. Adjusting cavities are sealed with a lead plug and back-up spacer to provide a tamper resistant seal.